Ten minutes into Romeo and Juliet the music stopped, the dancers disappeared and a contrite looking man walked on stage. He explained that the performance would be restarted as the projections weren't working. After a short wait they were fixed and we tried again. This time each character was introduced with a large projection of their character's name behind them. What I found fascinating was that even without the projections it was plainly obvious who was who purely through body language and staging. The stomping, muscled bad-boy? Well that's Tybalt. The robed man with the Shaolin dance style? Friar Lawrence. The leaping, graceful and vivacious teenage girl? No prizes for figuring that one out. That the show was this communicative so quickly bodes well, especially given my slight misgivings about ballet. Despite enjoying the ballet movie subgenre (both Red Shoes and Black Swan are faves), my sole direct experience a sceptical 13 year old me being dragged to Swan Lake. After an hour of flouncy, tutu clad leaping I was bored to tears. But perhaps now, with a bit of cultural experience under my belt (and a smidge more patience) this ballet might just be the one for me. Then again, maybe if 13 year old me had been taken to a ballet that featured the music of Jay Z, Katy Perry, LMFAO, My Chemical Romance and Lady Gaga I might have perked up a bit. 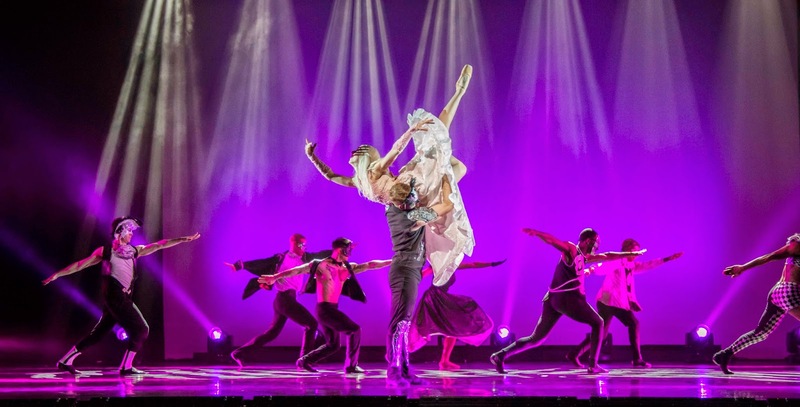 This production, by BAD BOYS OF DANCE, directed by Rasta Thomas and choreographed by Adrienne Canterna, sticks a mischievous middle finger in the face of snootily tuxedoed 'high' culture - popping Prokofiev on the same cultural shelf as Party Rock Anthem. Given that Romeo and Juliet is the story of two rebellious teenagers thumbing their noses at an ossified society and getting mad rutty, the obnoxiously punk attitude fits the material to a tee. The show is fuelled by the idea of kicking back against authority, which it does through gravity-defying somersaults and backflips, hip-hop influences in the dancing and the (slightly Baz Luhrmann influenced) fashions, which run the gamut from Gaga-ish art couture to Latin street gangs. Watching a narrative told through contemporary dance, even one as familiar as Romeo and Juliet, requires the audience to up their observational skills. Every facial expression, kick, bounce and gesticulation adds up to complex visual vocabulary. Whether you could watch this production while entirely ignorant of the story and pick up what's going on is iffy (they summarise the entire plot in the programme), but snatches of Shakespeare's dialogue spring to mind unbidden throughout, communicated purely through motion. Mercutio's strangled "A plague o' both your houses!" comes through as clear as day, as does Romeo's hushed "But, soft! what light through yonder window breaks?". Smooth as the dancing is, the slightly clunky pacing distracts. Rather than present a continuous narrative, the show is broken into 24 separate sequences, between which the stage is cleared and we dutifully applaud. If I were being charitable I'd suggest that this is to emulate the atmosphere of a pop concert, but realistically it's because these disparate songs don't quite fit together. While enjoyable as is, I can't help but feel this might have become stratospherically wonderful if they'd manage to mash each song into the next, 2 Many DJs style. As such, the experience is less that we're watching Romeo and Juliet and more that we're watching a Romeo and Juliet themed pop show. There's a decent argument that this makes it a bit plasticky - but then ephemeral, uncynical pop trifles are very much my bag. Anyway, regardless of all other concerns, seeing a daydreaming Juliet ecstatically dancing to Katy Perry's Teenage Dream, or their wedding soundtracked to Lady Gaga's Edge of Glory (complete with a hippie dance sextet), light up the pleasure centres of my brain like few other things I've seen on stage. Even if you're not into the whole pop thing, you can't help but appreciate the sheer skill of the dancers involved. I couldn't rip my gaze from Adrienne Canterna's Juliet. With a shock of glossy platinum hair she looked oddly ephemeral, as if her skin was made of glass. That apparent fragility makes each one of these leaps, tosses and flips that much more impressive - as if she'd shatter into a thousand pieces if she fell. At the other end the scale is Ryan Carlson's mean-as-all-hell Tybalt, whose muscular gymnastics infuse every motion into aggressive. I walked out of this show with a big smile on my face, swept up in the sheer performance energy throughout and the simple ballisness of squeezing Shakespeare and ballet into the same space as Bruno Mars and My Chemical Romance. On further reflection there's something intangibly missing: fragments of emotion that vanish into the narrative gaps. It all adds up to a hollow experience. But still, it's a hell of a fun hollow experience. Romeo and Juliet is at the Peacock Theatre until 29th March. Tickets here.